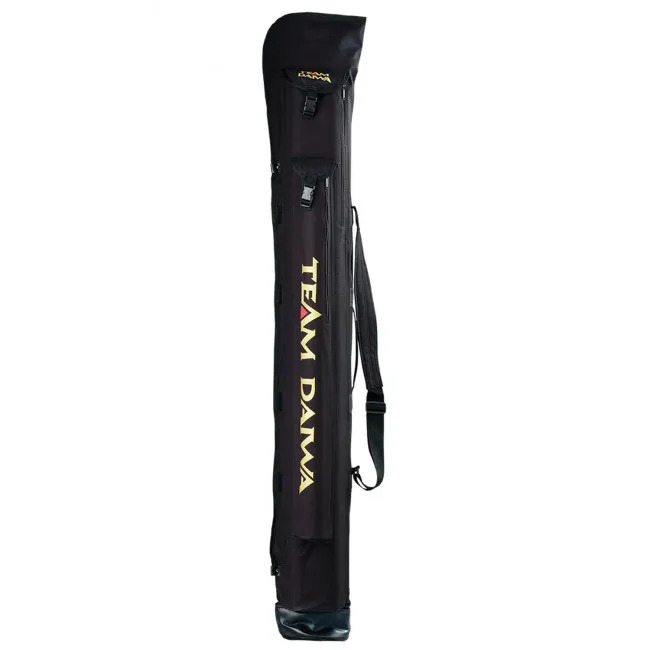 The Daiwa Matchman Holdall is a spacious pole holdall for the keen angler who enjoys match fishing. The large main compartment can hold approximately five tubes, allowing you to store a number of different set-ups with ease. With zip top access, it is very easy to slip your tubes into the 175cm long pouch – making packing up at the end of a session a little less of a chore. The Matchman Holdall also has a 146cm long umbrella pocket, with side zip access. This allows you to keep your umbrella with you at all times. As we British anglers’ know, if there’s one thing predictable about the UK’s weather it’s how unpredictable it is! The holdall as features a 100cm long bank stick pocket, which again can be accessed via a side zip. This Matchman Holdall is easy to carry thanks to the carry handle. It also features an adjustable padded shoulder strap, so you can keep your hands free for carrying additional gear should you require. A highly affordable range of luggage, the Daiwa Matchman range is ideal for novice anglers looking to buy their first set of top level luggage or for the angler who does the occasional ‘light’ travelling. All the match fishing luggage in the range has been manufactured to Daiwa’s exacting standards, so you can be assured of its impeccable quality. Daiwa has been producing tackle for more than 60 years and the Daiwa product portfolio features a comprehensive range of tackle for novice and life-long anglers alike. The largest Daiwa factory outside the Far East actually resides in Whishaw, Scotland, giving the range of Daiwa tackle a uniquely British feel despite its long standing Japanese heritage. A coarse and match fishing specialist brand, Daiwa produces outstanding products across the fishing disciplines and the brand is most famous for its technologically advanced fishing reels. Good value for money. My only concern is that the zip fastener on the rod section is not full length, however would recommend. good quality for the money. More space that I thought. Different compartments of various sizes big enough for rod, bank sticks, 42" landing net and pole plus plenty more space. Sits on my barrow or over my shoulder with ease. Nice lure although yet to try. Quality equipment and exallent service. Great quality, just what I wanted. Exactly what I wanted. Many thanks. the product was a good product but that is why I bought it. Zip broke after using 5 times spoke to Angling Direct they gave me a full refund.